In what might be the third-most New Detroit thing ever, the Detroit chicken lives in Oakland County. In what might be the second-most New Detroit thing ever, the Detroit chicken isn’t bred for its meat or its eggs. But perhaps the most New Detroit thing about the Detroit chicken is this: It’s a work of art, literally. This crowing, pecking, otherwise normal-seeming bird is an actual work of conceptual art, created last year and the 20th generation in Belgian artist Koen Vanmechelen’s ongoing project exploring concepts of diversity via poultry husbandry. This is a story about how an art chicken (that would be the Detroit chicken) went on to sire a food chicken, which in time will provide a new revenue stream for an urban farm in one of Detroit’s struggling neighborhoods. Briefly, art met utility and laid a bunch of tasty eggs. The Detroit chicken’s proper name is the Mechelse Wyandotte. And it’s the product of years of breeding by Vanmechelen, who gained international acclaim for the project that explores biocultural diversity by crossbreeding numerous species of chickens. And while the Detroit chicken is strictly an art project, it was bred with a common barnyard variety to create the Planetary Community Chicken. It will be used for food: Its eggs ‒ and eventually its meat ‒ will be sold at several farm stands in Detroit. The chickens are now living on Wasserman’s gentleman farm near Oxford and Metamora. They’re sorted by gender and breed and age, depending on their purpose at the moment, to grow or lay eggs or breed with one another. 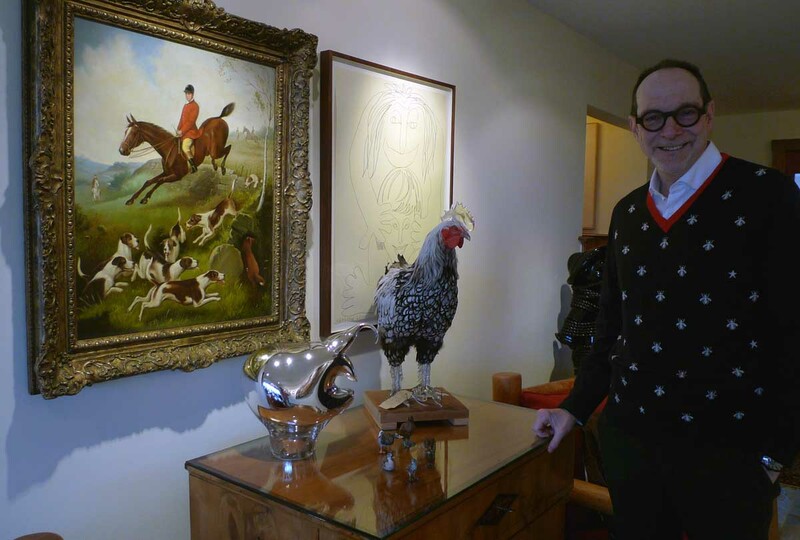 For Wasserman, a lifelong horseman, raising poultry is a new experience at age 67. But that’s what he committed to after the Cosmopolitan Chicken Project came to the Wasserman Projects, his Eastern Market kunsthalle, last fall. That’s German, roughly translated to “art gallery,” but connoting more of an immersive, educational experience than a space with paintings hanging on the walls. And a bunch of chicken coops is a lot more than you’d find in a standard commercial gallery. A Metro Detroit native and CEO of a specialty metals company, Wasserman opened the space in 2015 after years of living in Florida, returning to the city because he felt it had finally turned a critical corner, and he wanted to be a part of it, particularly its art scene. As Wasserman tells it, the history of the Cosmopolitan Chicken Project goes back to 1999, when Vanmechelen first crossed the French Poulet de Bresse with the Belgian Mechelse Koekoek, as an art project in a gallery very close to the border between the two countries. The resulting bird, which Vanmechelen christened the Mechelse Bresse, was hardy and beautiful. The artist took the project, and the new crossbred chicken, to England, then to the United States, Germany and on to Asia, the Middle East and elsewhere. Each generation is bred from the previous one, with an entirely new, local chicken added to the bloodline; all carrying the name Mechelse plus all or part of the local bird’s breed name. (An online chart of the crossbreeding is reminiscent of NCAA tournament brackets.) Each generation is limited to 500 offspring, and the birds are kept solely as art. Not even eggs are gathered from them, and none is slaughtered. Even allowing for the excellent care each generation gets, the birds have been uniformly sturdy and long-living, Wasserman said, with lifespans stretching to a dozen years or more, about four times that of a commercially bred chicken. Vanmechelen’s goal is to develop a bird with all the strains of the world in its bloodline, as a commentary on diversity and its power to strengthen populations. But by the time the project made its way to Michigan, mere conceptual art wouldn’t do, Wasserman said. And so he and Vanmechelen conceived the Planetary Community Chicken, the cross between the Mechelse Wyandotte – the Detroit chicken – and the ISA White. Henri and Jean-Paul, two roosters from the former, the “art chicken,” as Wasserman calls them, are cooped up with a few ISA White hens, doing what males and females do. The hens are laying fertile eggs, some of which are incubated and hatched in the service of a new hybrid that will be entrusted to the Oakland Avenue Urban Farm in Detroit. Jerry Hebron, executive director of that 4.8-acre farm in the city’s North End neighborhood, anticipates the birds will arrive within the next few months, after either the approval of an urban livestock ordinance or, plan B, allowed as an education and research project. The flock would be the farm’s first venture into animals, or “healthy protein,” as Hebron calls it. Many in Detroit keep backyard poultry in the city, although it’s illegal. Occasional crackdowns by animal control officers make the news, and with vacant lots in many neighborhoods being converted to large garden plots, at least some accommodation of livestock is underway. Hebron said city planners are working on an ordinance, but the farm won’t keep chickens until it can do so legally. With the rising popularity of backyard chickens, various Michigan cities have adopted similar ordinances, some allowing them with restrictions, others banning them outright. The chickens eventually will live in a house on the Oakland urban-farm property, with access to the outdoors for free ranging. They’ll primarily be egg layers, but Hebron said meat sales are possible for older birds, eventually. The house will also be an art space, in keeping with the birds’ pedigree and the farm’s mission as a community resource. It’ll be a version of the indoor operation Wasserman and Vanmechelen set up in the Eastern Market last fall. There’s also a Mechelse Cemani rooster in residence on the Wasserman farm, the 19th-generation Cosmopolitan Chicken, and Wyandotte hens, the pairing that produces the Detroit chicken. The Wyandottes are a breed that was common around the southern Great Lakes, named for the local Native American tribe. The Cemani rooster’s most recent bloodline infusion comes from Indonesia, where his daddy was the Ayam Cemani, a highly prized, jet-black bird thought to have enchantment in its blood – it’s coveted by mystics. 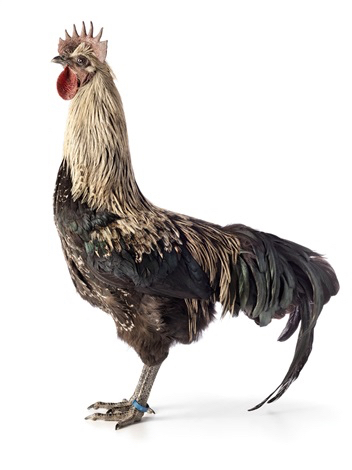 The Mechelse Wyandotte roosters picked up some of its ancestor’s dark plumage, but have lighter-colored, mottled necks. Some young hens at Wasserman’s farm are showing iridescent black feathers overall, with undertones of green and red. It’s a small operation, but growing with every hatched egg. Wasserman said he and his farm manager, Terry Delaney, had to get a crash course in chicken raising from Hendrix Genetics, a commercial husbandry company. Today, the birds occupy coops Delaney built for them, as well as a number of stalls in the horse barn. A recent cull of young Planetary Community roosters made the barn a lot quieter, and the horses happier, Delaney said. The flock will soon have a sizable pasture to roam free in. The Mechelse Wyandotte cross is already doing its part to propagate the next generation of the art project, in Denmark. The birds on Wasserman’s farm are settling in, the roosters crowing and the hens clucking around the coops and yards. Hebron, preparing to accept the first flock of Planetary Community Chickens, acknowledges the project sounds a little daffy, but its marriage of art and practicality was instantly understandable to her. Everything that is old is new again.